As has occurred in February for the past few years, the Chair of the Council of the Australian Air League, the League’s Secretary, Federal Staff and the Executive Commissioners had the pleasure, and honour, to spend a Saturday and Sunday with the ‘cream’ of the Australian Air League’s youth membership. 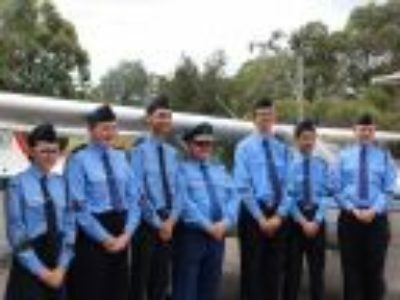 The selection of the Cadet of the Year once again, took place at the NSW Boys’ Group Air Activities base at Camden in conjunction with the meeting of the Council of the Australian Air League being conducted on the Saturday and with the Cadet of the Year flying, and selection, on the Sunday. Interstate members of the Council of the League, together with the candidates from Queensland, Victoria and South Australia travelled to Sydney’s Kingsford Smith Airport, were met on arrival and transported to Camden to meet up with the NSW based members of the Council and the two candidates from the NSW Girls’ and Boys’ Groups. Sqn Sgt Tom Houghton, a previous Cadet of the Year candidate and current Chair of the Cadet of the Year Advisory Group (COYAG) attended the weekend to support the candidates and to present the COYAG report to the Council on Saturday evening. During the Saturday Tom managed the candidates, networking with them and together they were able to visit the Camden tower and make plans for COYAG in 2015. Two years ago the weather in Melbourne was extremely hot and last year Camden experienced low cloud and rain which prevented Saturday flying and it looked like this would occur again this year. The weather on Saturday was unsuitable for our flight plans and it looked like the Sunday was going to be the same. Accommodation was at the Narellan Motor Inn and dinner was provided at Bluey’s Brasserie at the Camden Sports Club where the presentations took place after enjoying dinner. As part of the Cadet of the Year evaluation process all candidates are required to make a 15 minute presentation to enhance their opportunity to be selected as the League’s Cadet of the Year. This year the topic of their presentation was “Building fellowship in the Air League: the challenges and benefits”. All of the Senior Officers marked these presentations taking into account delivery, confidence and relevance. Sunday’s weather was acceptable at the motel, with balloon flights observed, however closer to Camden came overcast skies and on arrival the candidates sat down to a knowledge assessment, uniform inspection and, afterwards, commenced their individual panel interviews. A change of weather meant a change of plans and very quickly we got aircraft in the air and all candidates experienced a flight without disrupting the interviews. Any of the nominated candidates would be able to represent our Organisation with pride and should be very proud of their performance. All were winners! On behalf of the Australian Air League Inc., may I extend hearty congratulations to the winners and commiserations to their colleagues who were not successful. To miss out on selection in such company is no disgrace as those selected, to represent their Groups, were truly outstanding in all aspects and their parents, officers and colleagues can be very proud of them. The League’s thanks go to the NSW Boys’ Group for making the venue available, the NSW Boys’ Group Air Activities staff that assisted throughout the weekend and to the Debbie and Mark Perinich who provided the assembled group with a fabulous BBQ lunch on the Sunday. Thank you also to the NSW based Federal staff that provided the transport to and from the airport.